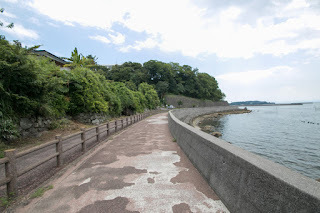 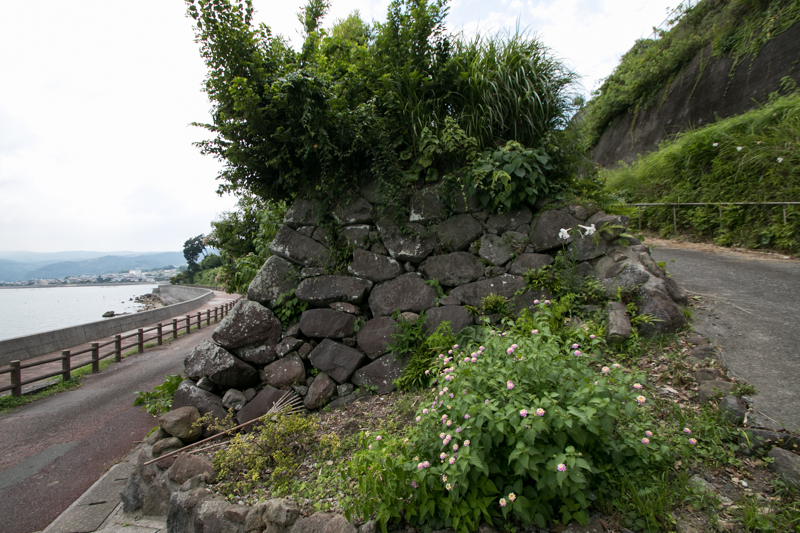 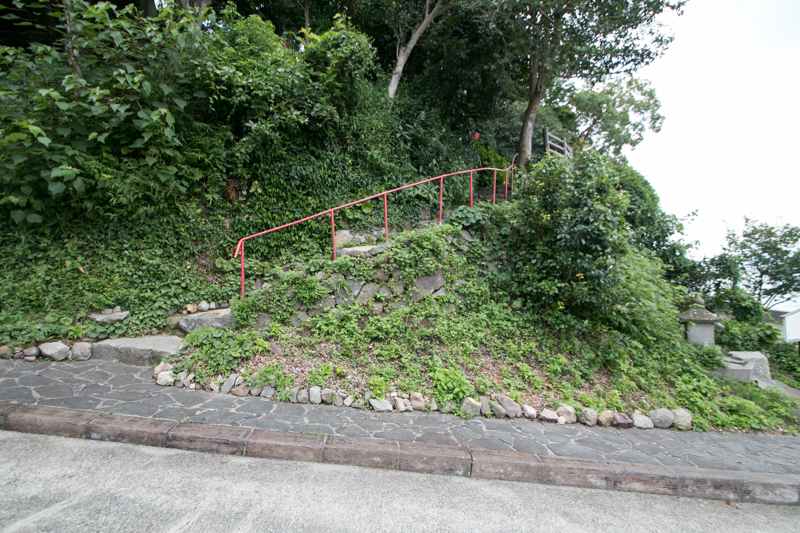 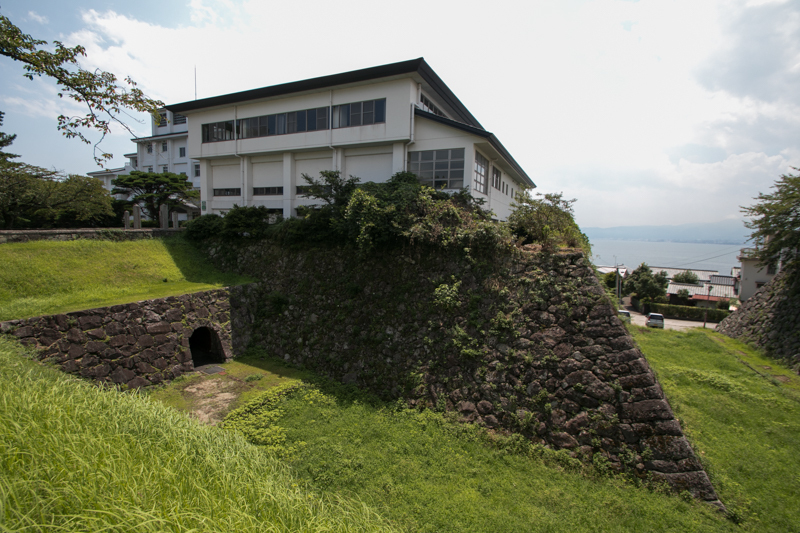 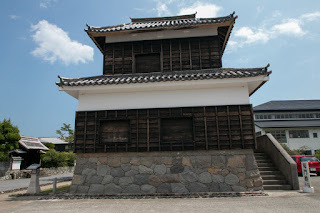 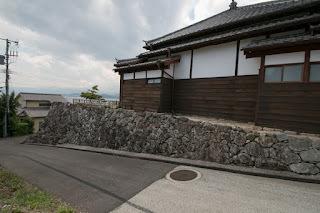 Hiji castle (日出城) is located at coastal terrace facing Beppu bay at the center of Hiji town. 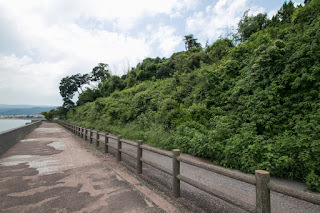 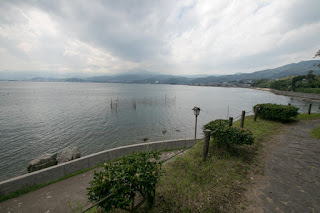 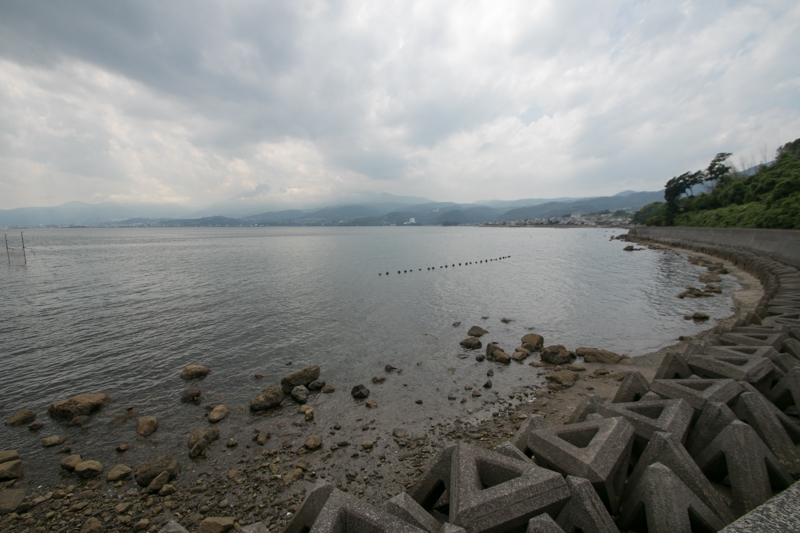 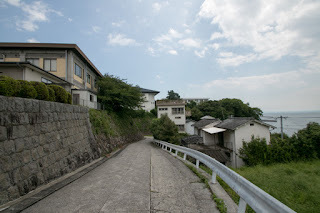 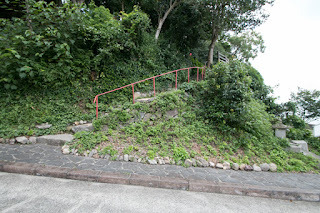 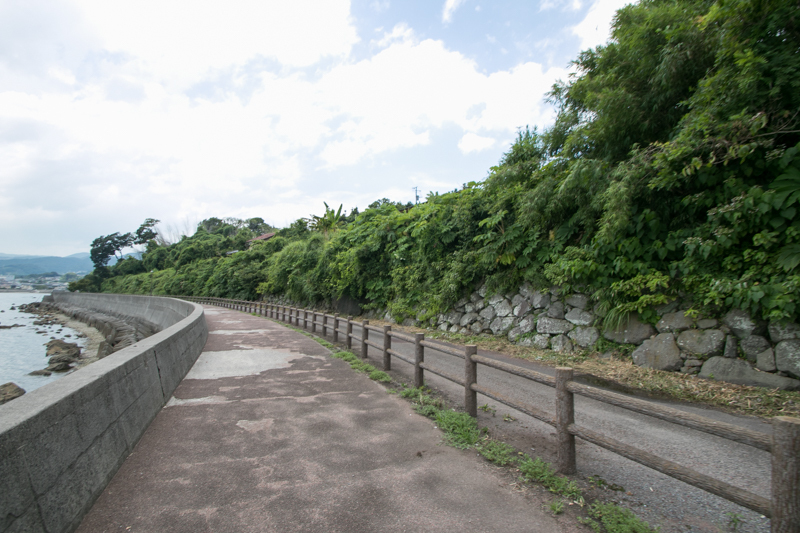 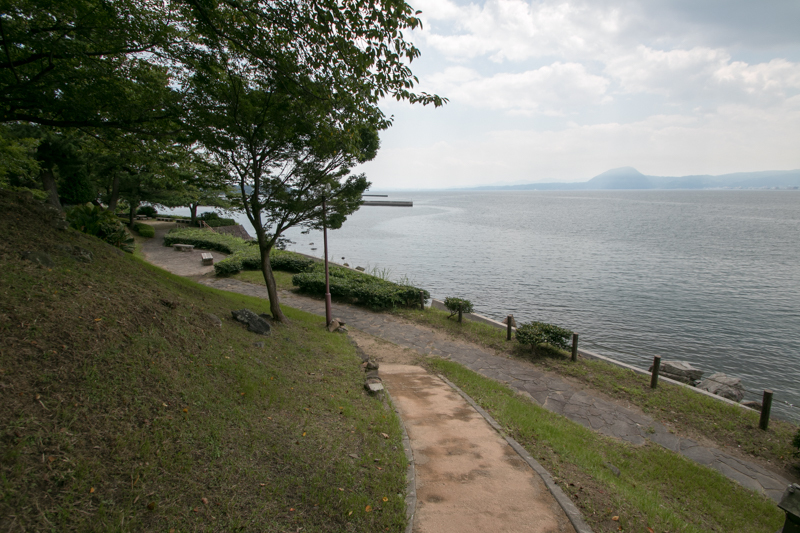 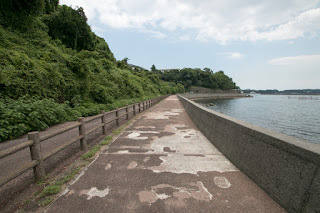 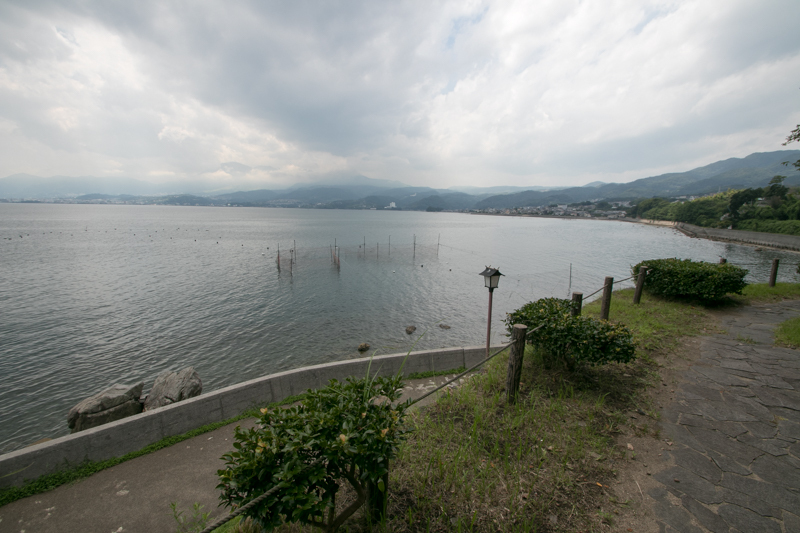 Hiji area is a narrow flat area surrounded by sea, mountains and two rivers at the opposite of Beppu bay from Oita city, and because of its bottleneck terrain it is an important place to manage the communication between Oita area and north part of Kyushu island. 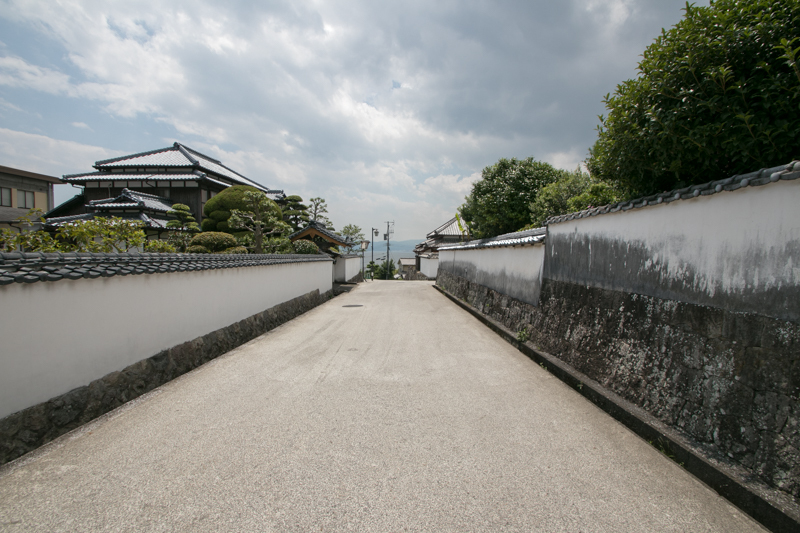 Hiji town places two major sightseeing place it mean Beppu city which was famous for its spa and Kitsuki town known for its traditional Samurai town, and Hiji town itself has many historical ruins. 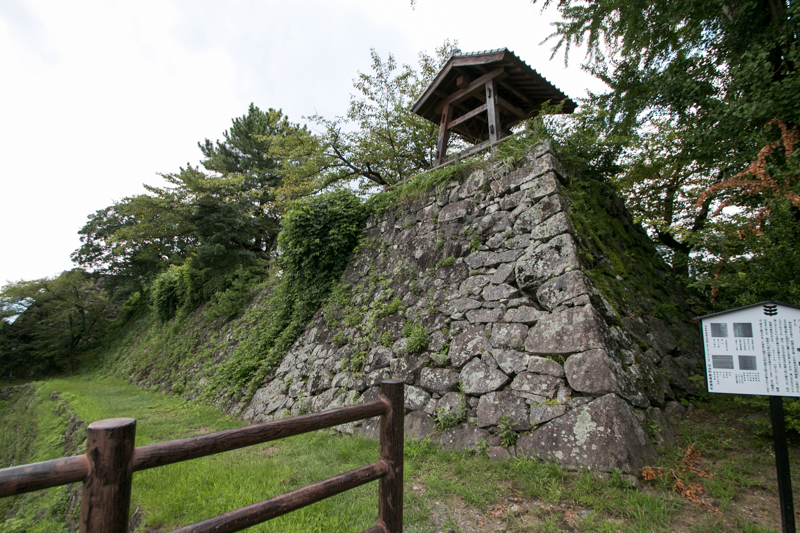 In medieval era, Hiji area was governed by local lord Hazama clan, who resided at Madake castle at the north side mountain of Hiji area. 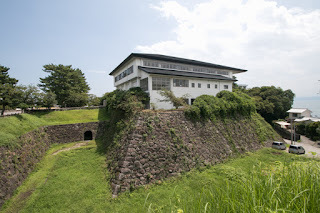 Hazama clan served to Otomo clan which was the governor of Bungo province (Oita prefecture), and when Otomo clan was attacked by Shimazu clan which was the governor of Satsuma province (Kagoshima prefecture), Hazama clan rejected overwhelming Shimazu army same as Kitsuki castle. But along with the expulsion of Otomo clan by central ruler Hideyoshi Toyotomi (1537-1598), Hiji clan lost the position of local lord. After the fall of Otomo clan, Naotaka Fukuhara (?-1600) who was the administrative staff of Hideyoshi and brother in law of Mitsunari Ishida (1560-1600), the chief administrative staff of Toyotomi government, became the lord of Oita area and Hiji area. 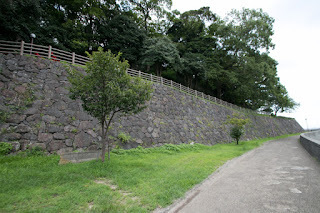 But in 1599, after the death of Hideyoshi, among the conflict between Mitsunari and Ieyasu Tokugawa (1543-1616), the largest lord under Toyotomi government, Hiji area was confiscated by Ieyasu and finally Naotaka was forced to suicide after the defeat of Mitsunari at the battle of Sekigahara in 1600. 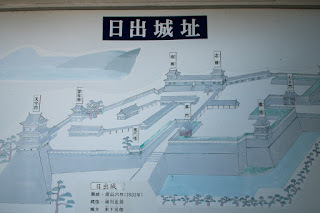 Next to Fukuhara clan, Tadaoki Hosokawa (1563-1646) who was the lord of Tango province (north part of Kyoto prefecture) at Tanabe castle, held Hiji castle along with Kitsuki castle as a distant area. 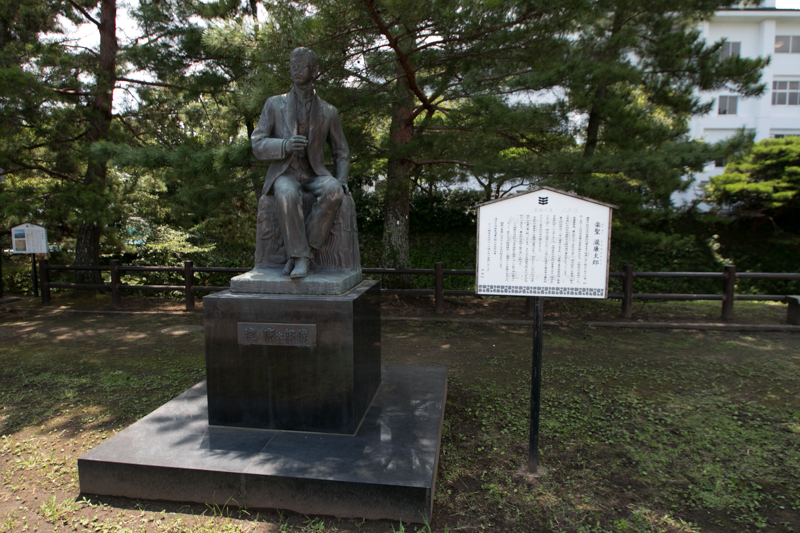 Tadaoki was a son of Fujitaka Hosokawa (1534-1610), who was a relative of distinguished family Hosokawa clan and known for the knowledge for Japanese poem and courtesy. 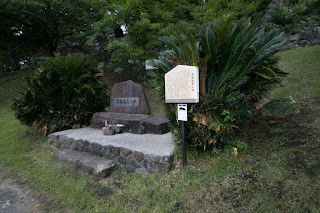 Fujitaka was also good at scheming, and survived turbulent situation and became the large lord under Toyotomi government. Tadaoki was a brave general but also a prince good at Japanese tea ceremony and poem. 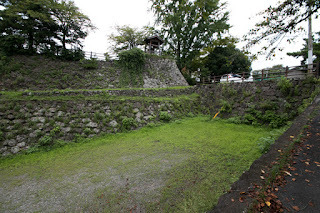 Tadaoki married with Tama (1563-1600), who was the daughter of Mitsuhide Akechi (1528-1582) who made a coup d'?tat against central ruler Nobunaga Oda (1534-1582). When Hideyoshi and Mitsuhide fought at the battle of Yamazaki, Hosokawa clan belonged to Hideyoshi and Tadaoki once had to separate with daughter of rebel. 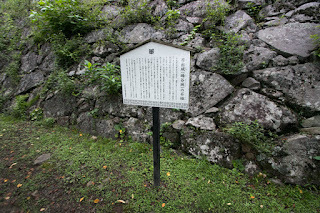 But later Tama was forgive, and became Christian then had a name of Garasha. 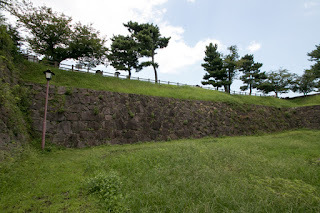 Before the battle of Sekigahara, Mitsunari who seized Kinki region surrounded family of Tokugawa supporting lords stayed near Osaka castle as enforcement, but Garasha chose to die not to be kept as a hostage. 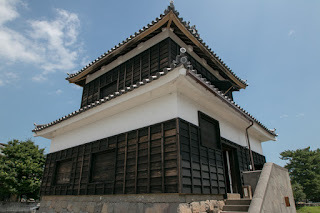 Tadaoki lost his wife but bravely fought at the battle of Sekigahara, then after the battle Ieyasu gave whole Buzen province (eastern part of Fukuoka prefecture) then Hosokawa clan became a large feudal lord at Nakatsu castle. 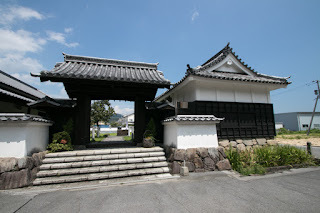 At this time, Nobutoshi Kinoshita (1577-1642) who was younger brother in law of Tadaoki, was also appointed as a lord of Hiji area as an supporting lord of Hosokawa clan. 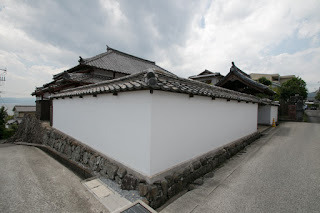 Nobutoshi himself was a son of Iesada Kinoshita (1543-1608), who was a brother of Nene (1547-1624, also known as One, Kitanomandokoro or Kodaiin), a formal wife of Hideyoshi Toyotomi. 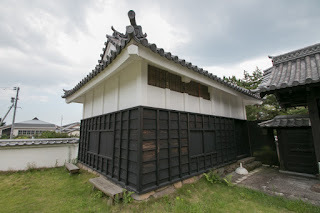 Originally Kinoshita clan was a small retainer under Nobunaga Oda, but far upper than Hideyoshi who was born at a house of poor pheasant and did not have sir name. 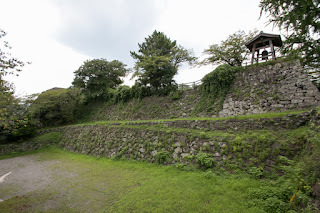 Hideyoshi promoted under Nobunaga by his excellent talent and charming skill, but did not have close retainer except for his trusted younger brother Hidenaga Toyotomi (1540-1591). 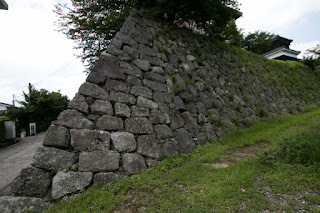 To strengthen his group, Hideyoshi hired people of Kinoshita clan including Iesada and Nobutoshi as close retainers. 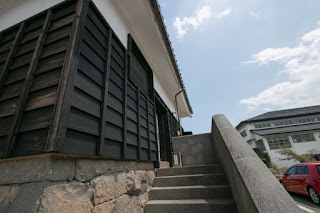 Hideyoshi was cruel for his own relative except for his mother and Hidenaga, but treated people of Kinoshita clan with courtesy as a family of wife, even though did not promote them. 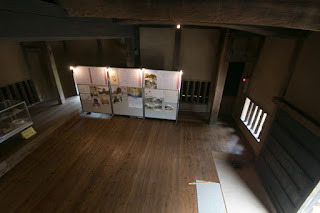 As Nene supported Hideyoshi from poor period, and people of Kinoshita clan who were certain retainers of Nobunaga were precious resource at start up period of Hideyoshi. Later Hideyoshi appointed Iesada as a lord of Himeji castle (Hyogo prefecture), an important base of Toyotomi clan. 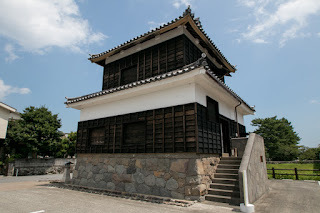 Furthermore, Hideaki Kobayakawa (1577-1602) was sent to an adopted son of Kobayakawa clan, an important retainer of Mouri clan and became a large lord. 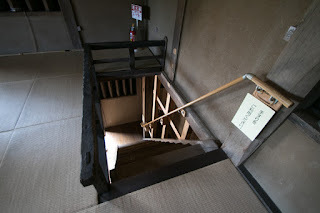 In 1598, Hideyoshi died in ill and situation of Kinoshita clan people became uneasy. 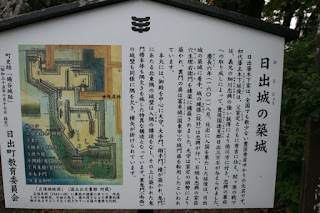 But Nene did not have son between Hideyoshi, and his concubine Yodogimi (1569-1615) had Hideyori Toyotomi (1593-1615), heir of Hideyoshi. 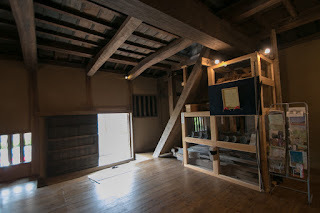 Then Nene and Kinoshita clan people were not involved into political conflict between Toyotomi clan and next ruler Ieyasu Tokugawa (1543-1616). 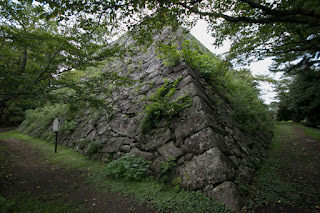 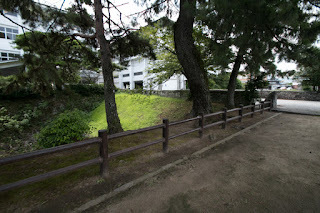 Finally Yodogimi and Hideyori were ruined by Ieyasu at the battle of Osaka castle in 1615, but to keep the loyalty of former generals of Hideyoshi and avoid further bad reputation, Ieyasu tried to keep away Nene from Osaka castle and did not threat Nene her and other Kinoshita clan relatives. 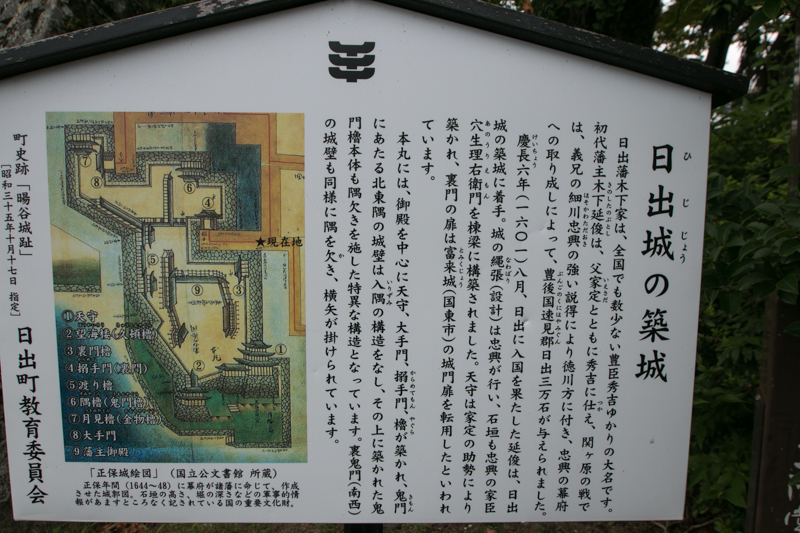 Nobutoshi Kinoshita who became the lord of Hiji area decided to avoid inconvenient Madake castle and build a new one along the sea. 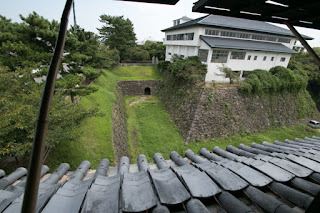 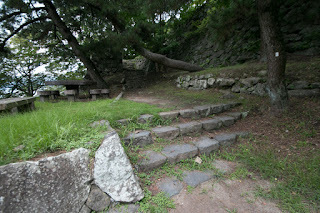 Location of castle is an arrow head shaped terrace of 400 meter long and 200 meter wide surrounded by sea and river. If large territory lord built a castle there it could be a splendid one, but Kinoshita clan was a small lord of about 30,000 Koku (unit of rice harvest). However, Nobutoshi could rely on Tadaoki Hosokawa, his brother in law, resided at the next of his territory. 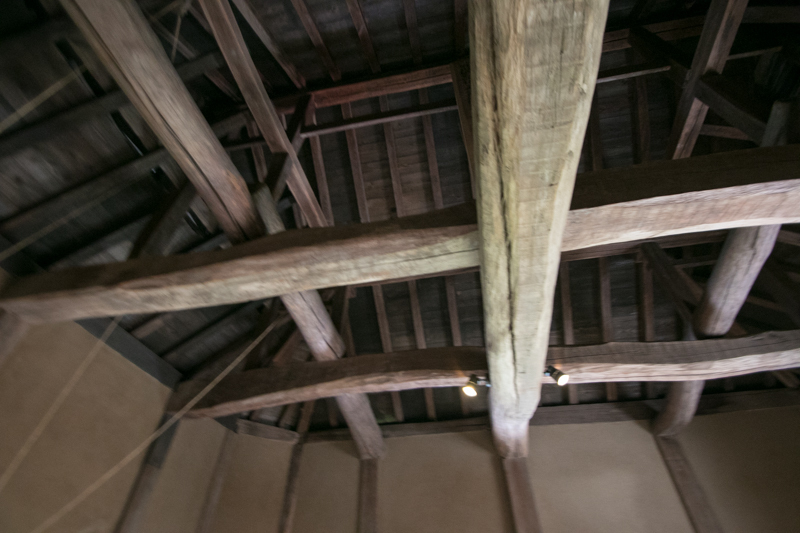 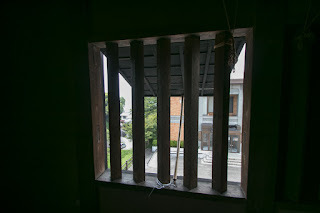 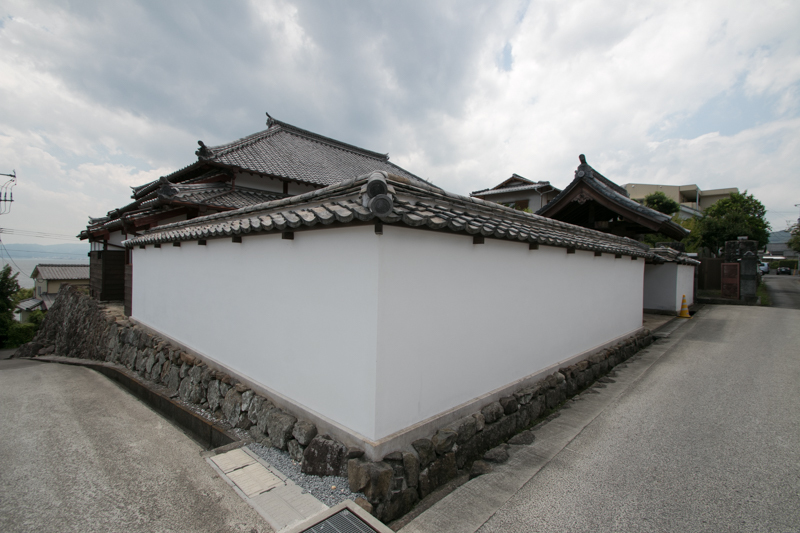 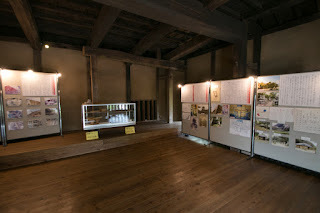 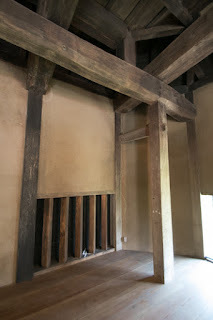 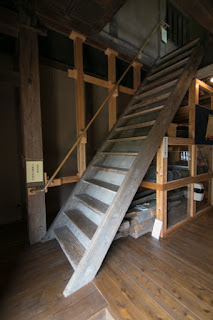 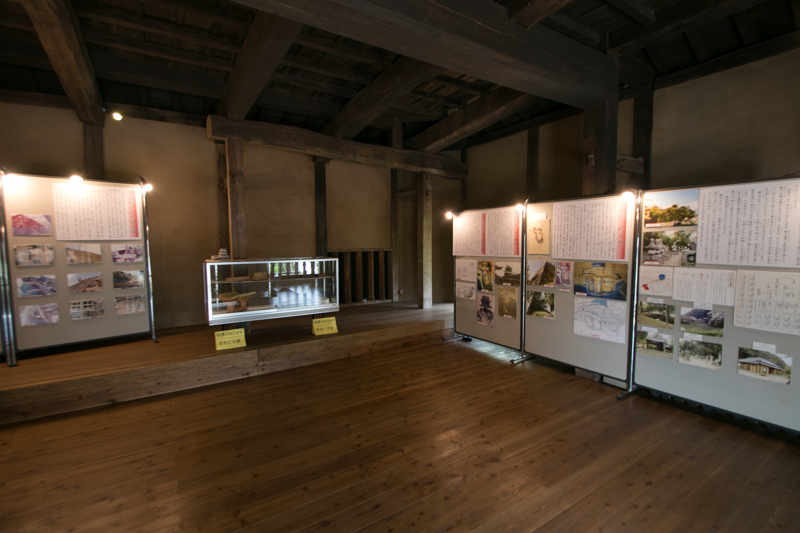 Even now many houses are built by support of wife's parent home, and in this case Hosokawa clan was a distinguished family and one of the largest lords in Japan. 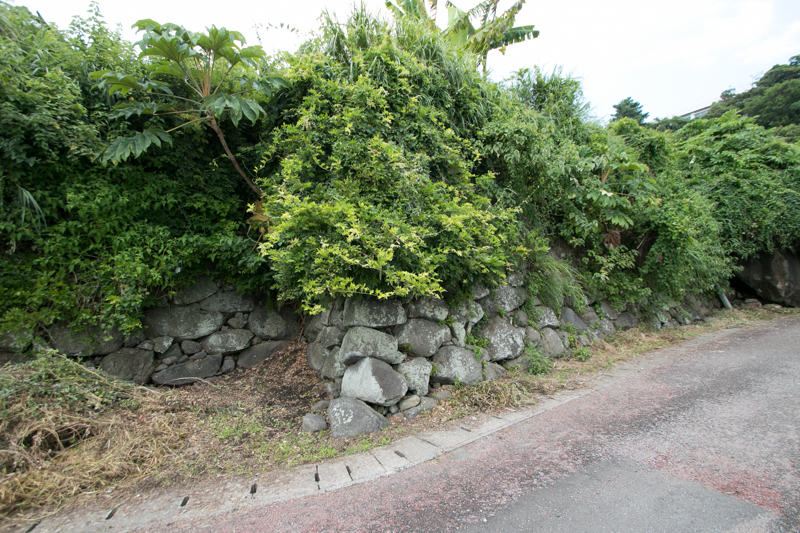 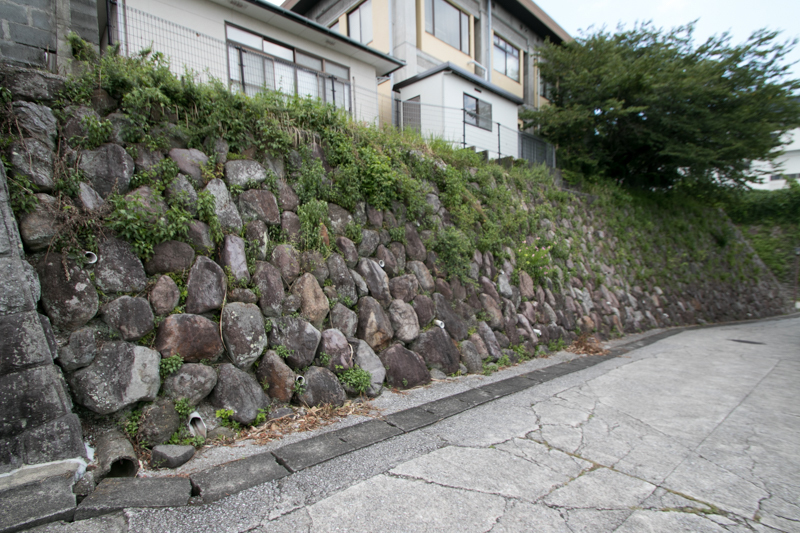 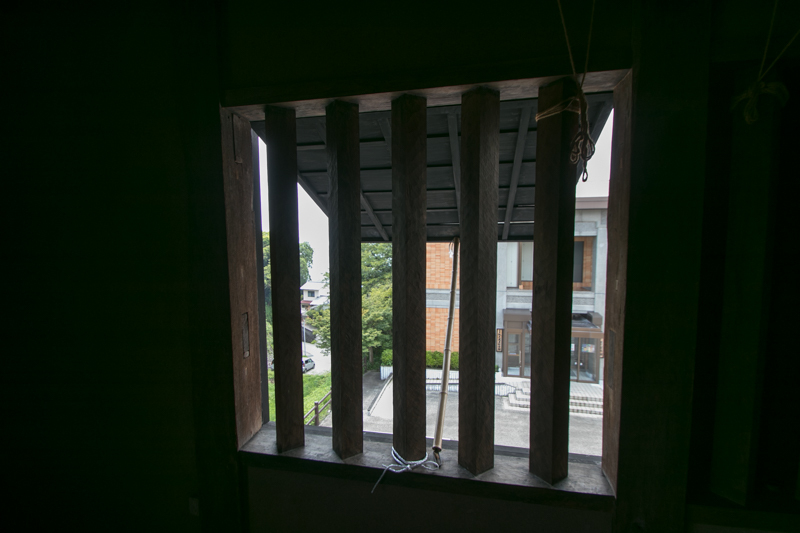 To support construction, Tadaoki sent his retainer who had a skill of stone wall construction along with workers and funds. 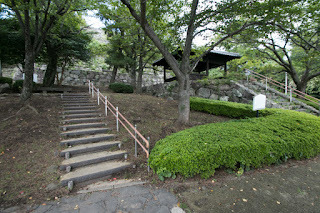 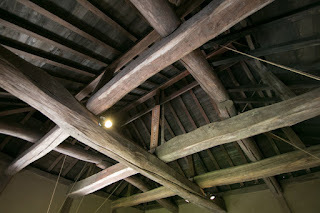 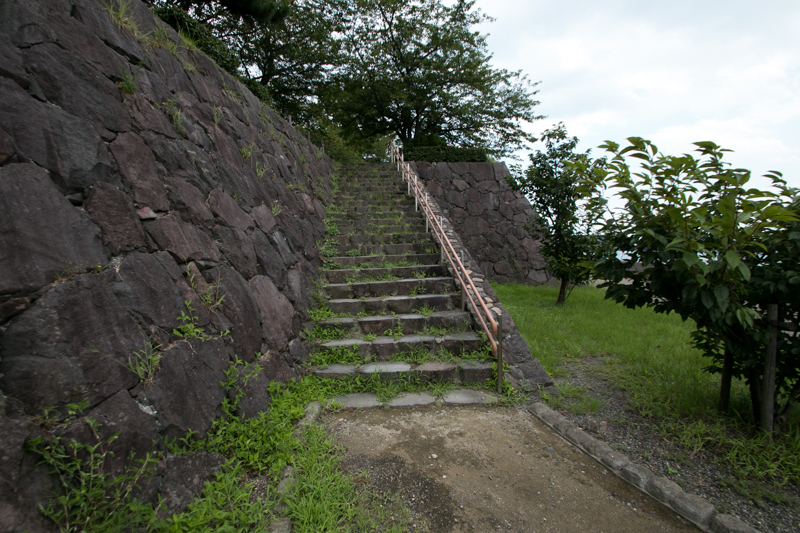 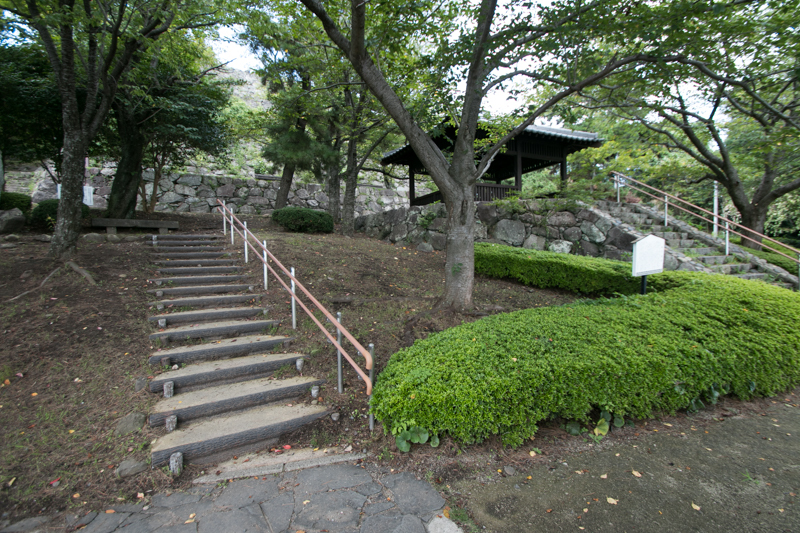 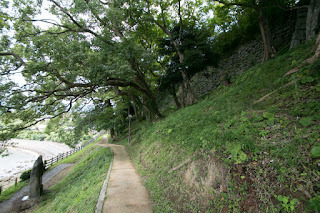 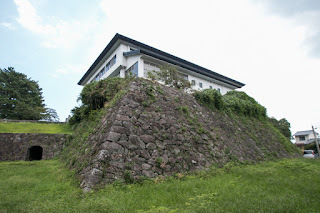 As Tadaoki entered already completed Nakatsu castle and Kokura castle, then he might hoped to build castle by himself. 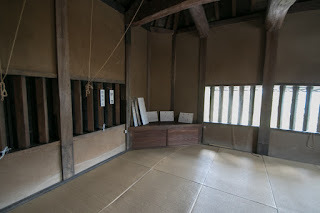 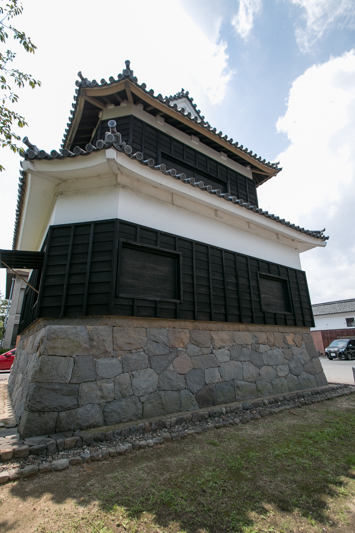 After one year construction Hiji castle which was unmatched to small lord completed. 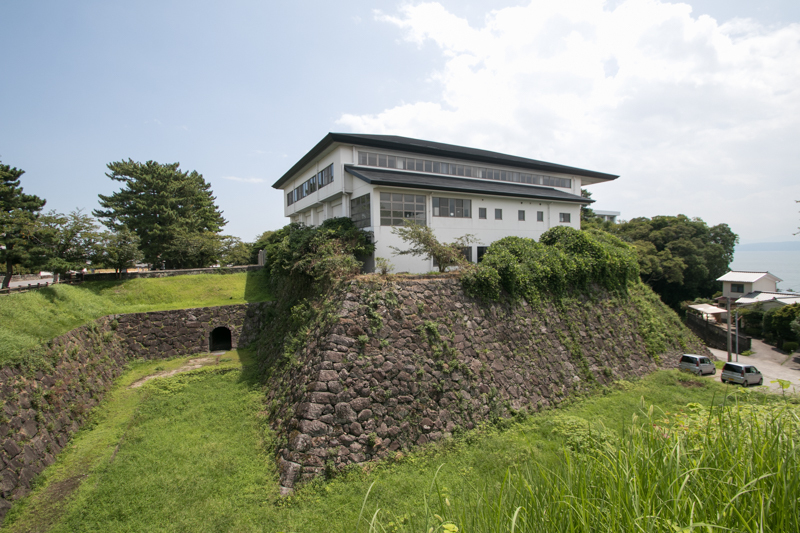 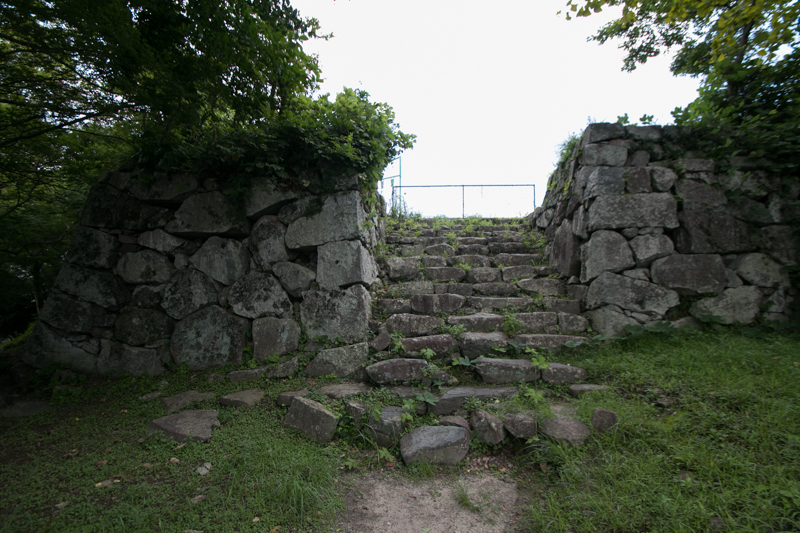 Core part of Hiji castle consist of central area, secondary area and third area placed in line from west to east along with the sea. 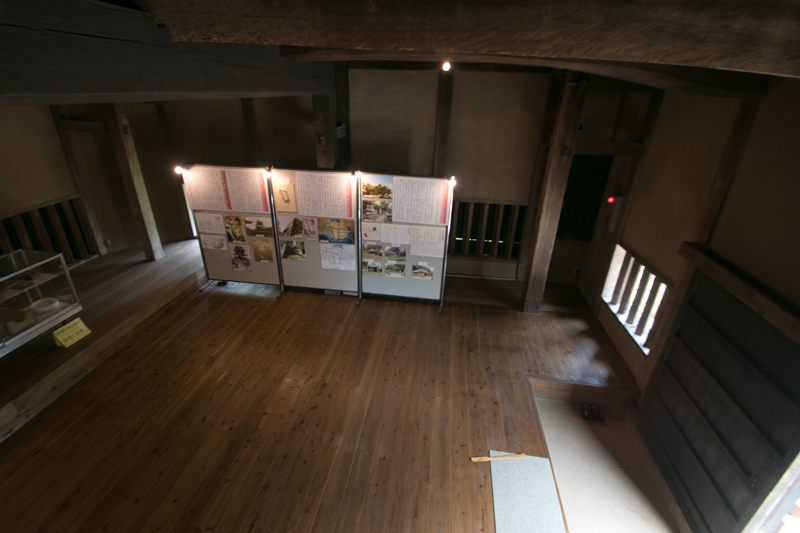 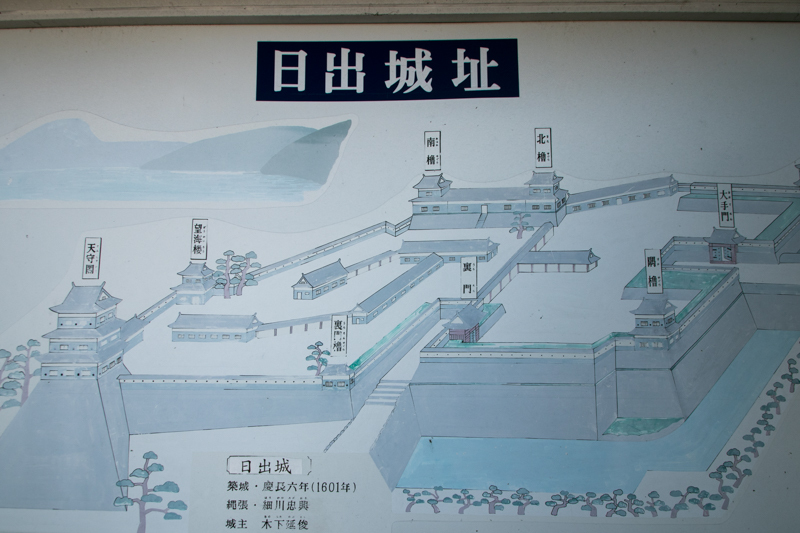 Central area of the castle is a rectangular area of 100 meter lengthwise and 50 meter crosswise, having a projecting corner at its northwest side. 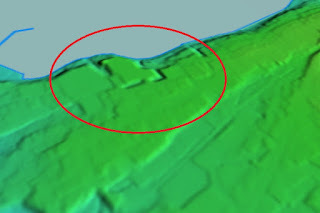 As this area is located at southwestern edge of the height, its west and south line was guarded by sheer cliff. 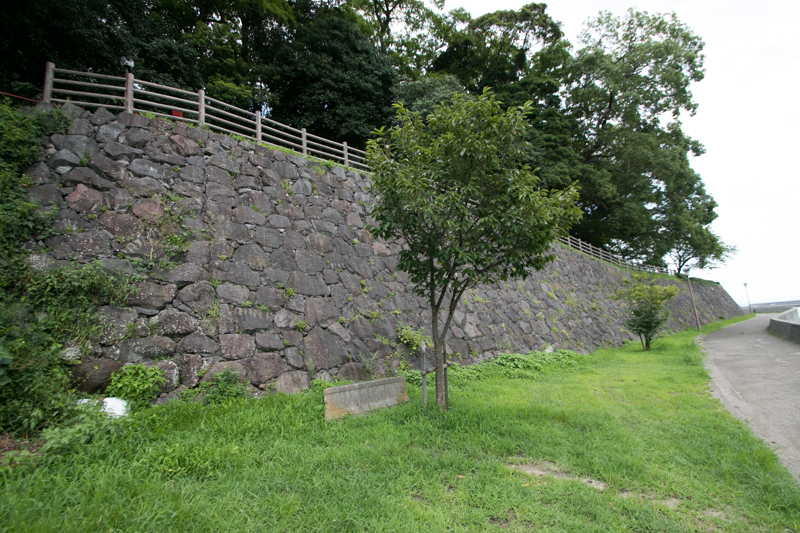 Three direction of the central area except for southern line facing the sea is separated by wide dry moat, and wall of the area is perfectly covered by sheer stone wall. 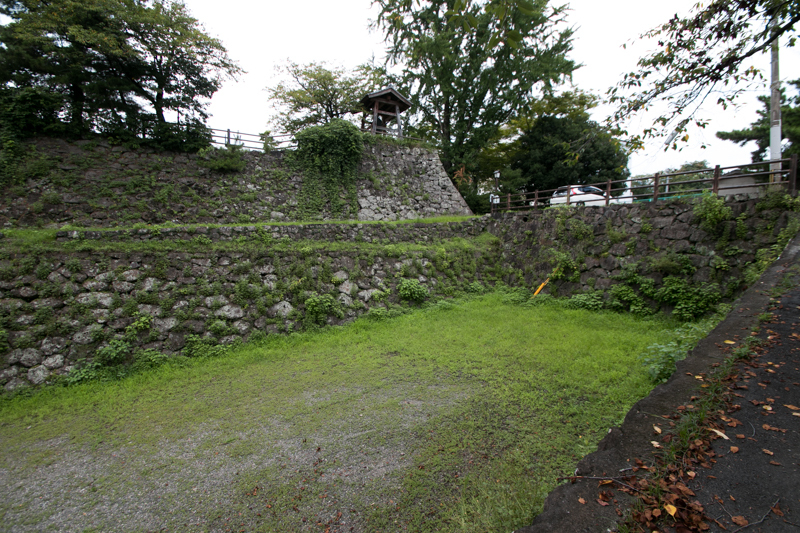 At the south east corner there is a 20 meter long square main tower basement, and a three story main tower was built here. 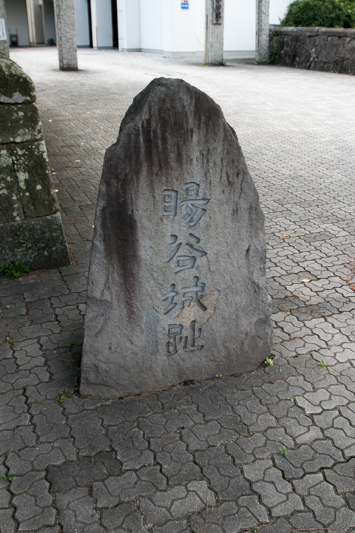 Interestingly, northeastern corner is cut out as a charm, as in traditional Japanese incantation way this side is believed as a place of devil. 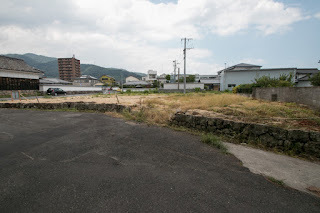 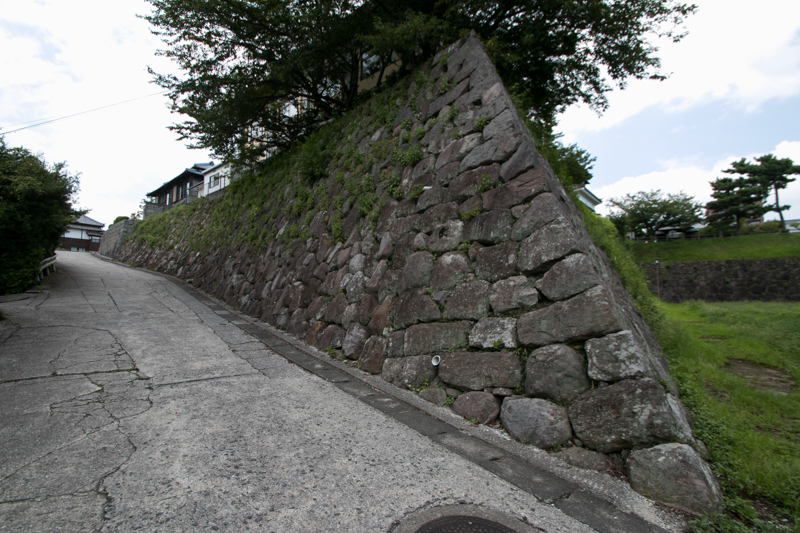 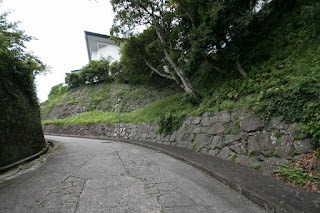 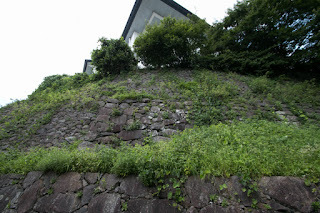 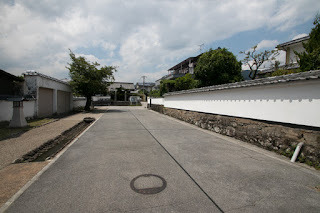 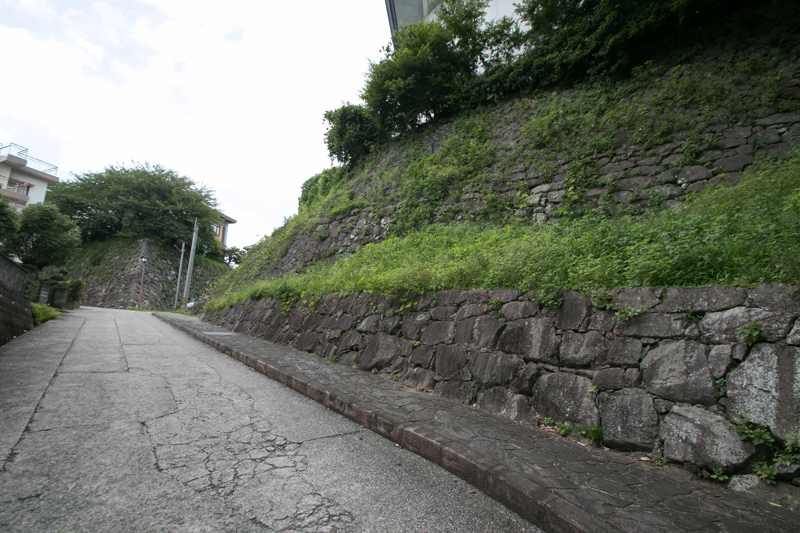 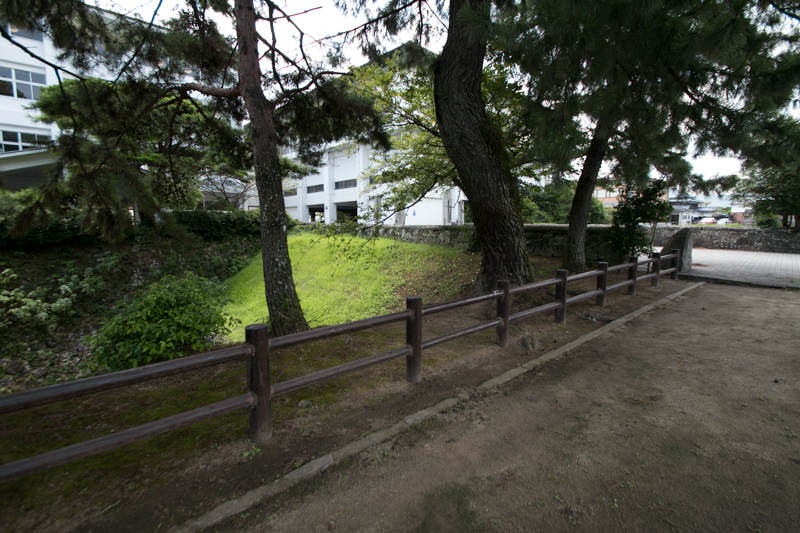 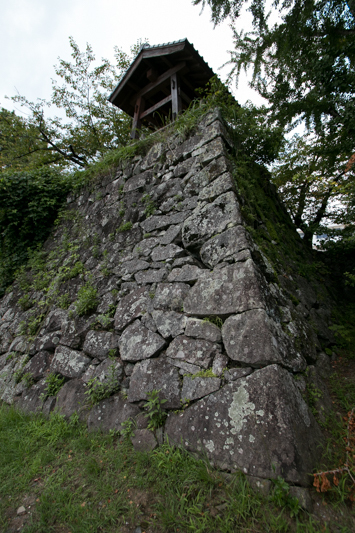 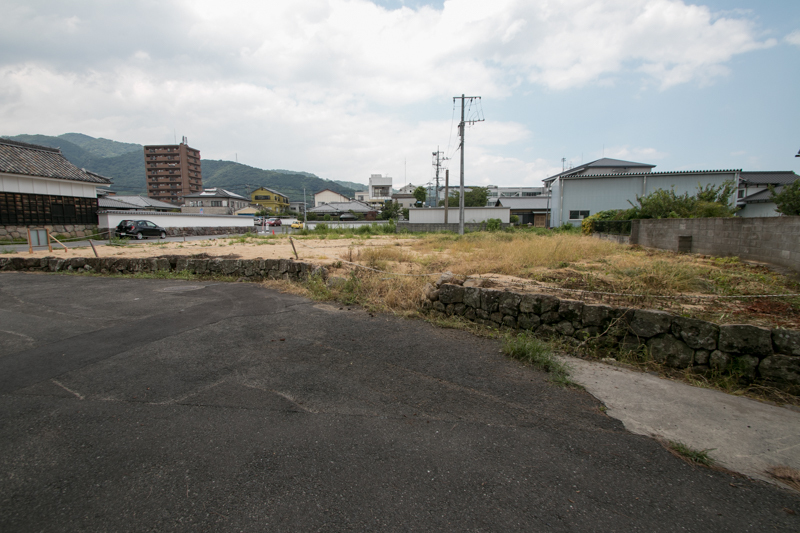 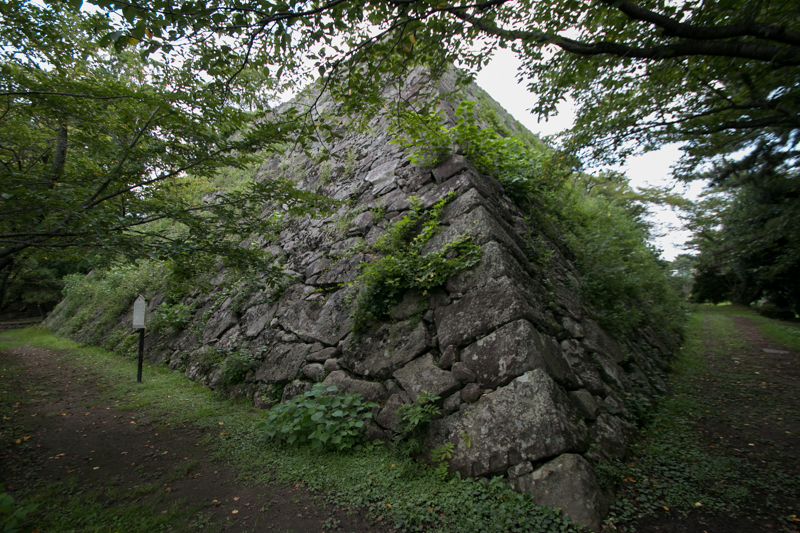 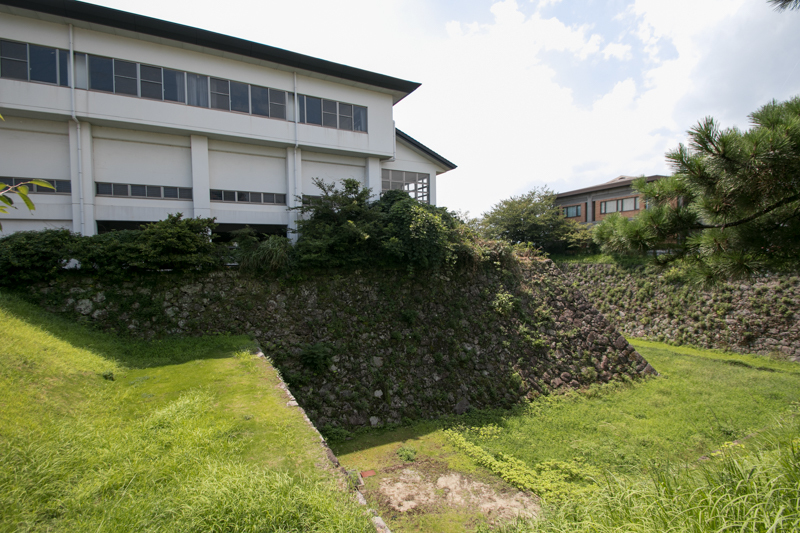 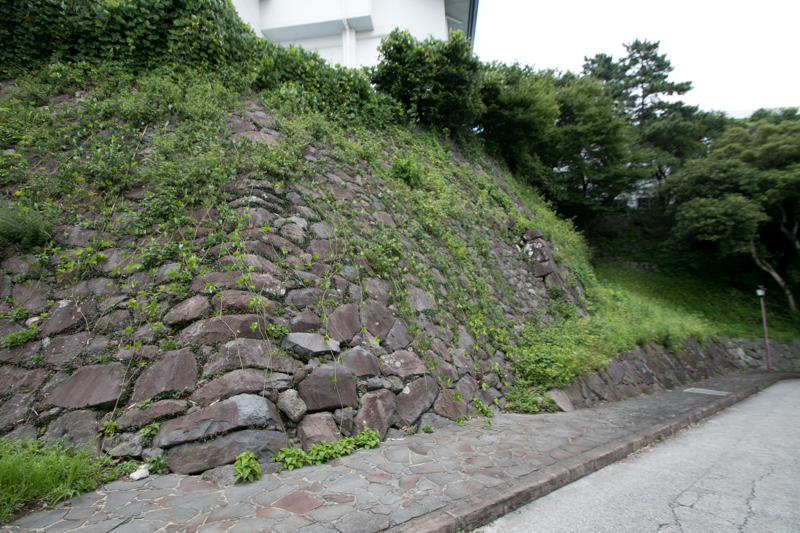 At this corner there is a two story corner turret named as Kimon (direction of devil) turret, and this turret also had it northeast corner diagonally cut. 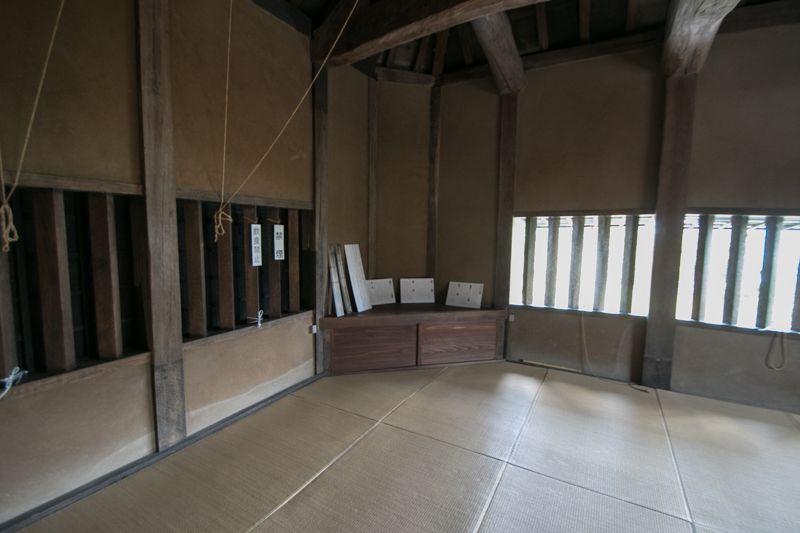 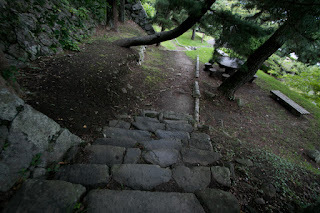 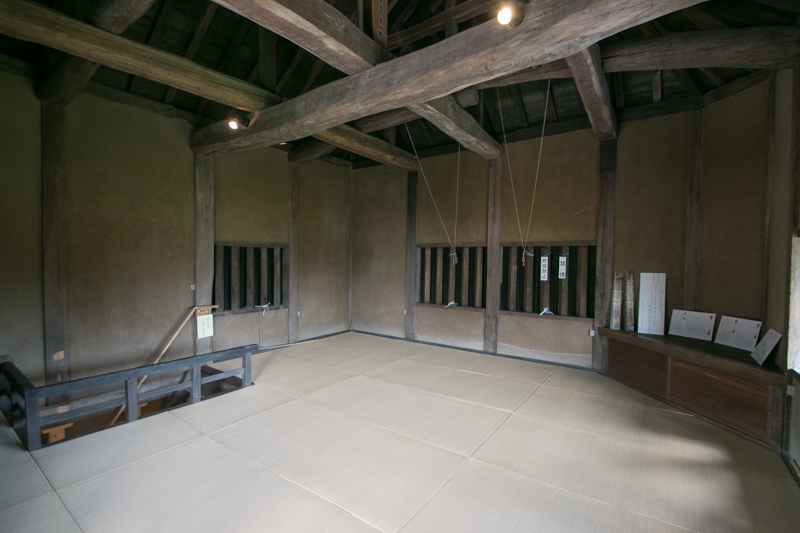 As Hosokawa clan was an expert to traditional Japanese courtesy, then this style might be brought to this castle. 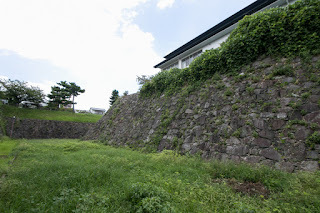 Secondary area and third area was separated by dry moat and clay wall, and only had stone wall at its gate. Outer area surrounded core areas of the castle also having only low stone wall, and total size of the castle was 400 meter long and 200 meter wide. Kinoshita clan named this castle as Yokoku castle, utilizing the word used in classical literature of ancient China meaning the place of sunrise with hot spa. 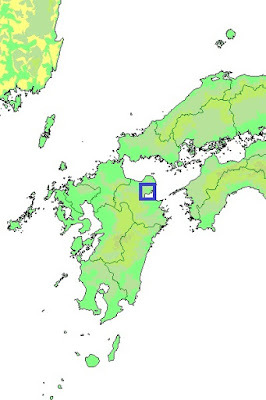 As Hiji area is located at the east of Kyushu island and having spa at neighbor place, this name might be decided. 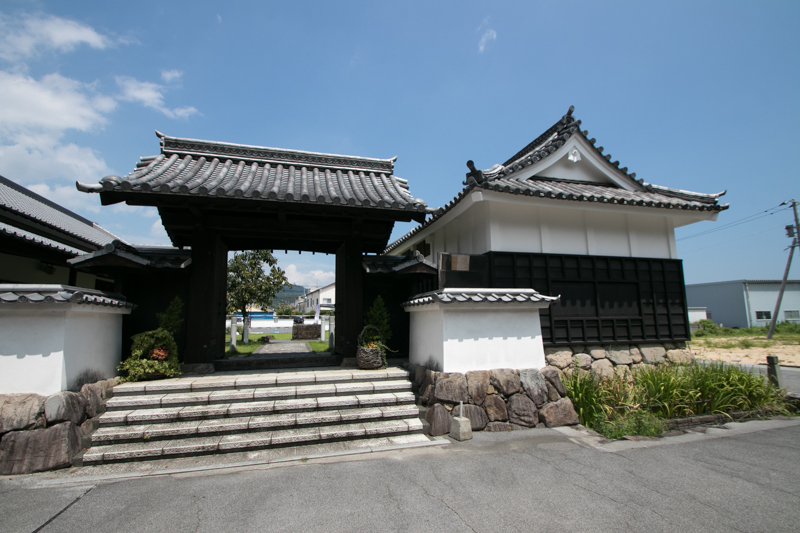 Later Hosokawa clan moved to Higo province (Kumamoto prefecture) and became a lord of Kumamoto castle, but Kinoshita clan stayed Hiji area and served as the lord of Hiji castle until the end of Edo era. 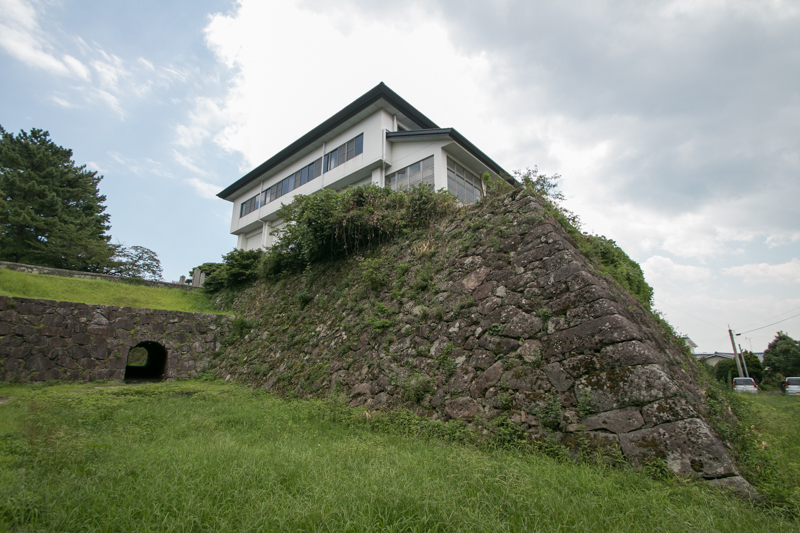 Subsequent to Meiji revolution most building were broken, but Kimon turret was purchased by local people and survived until now. 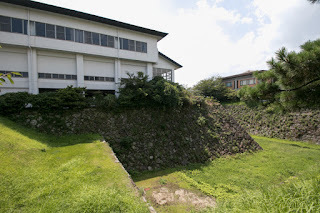 Today central area and secondary area are used as ground of school, thus only exterior is seen from outside but still sufficiently powerful. 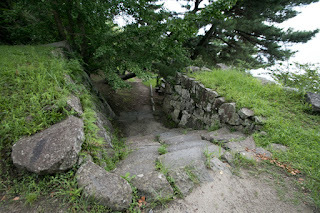 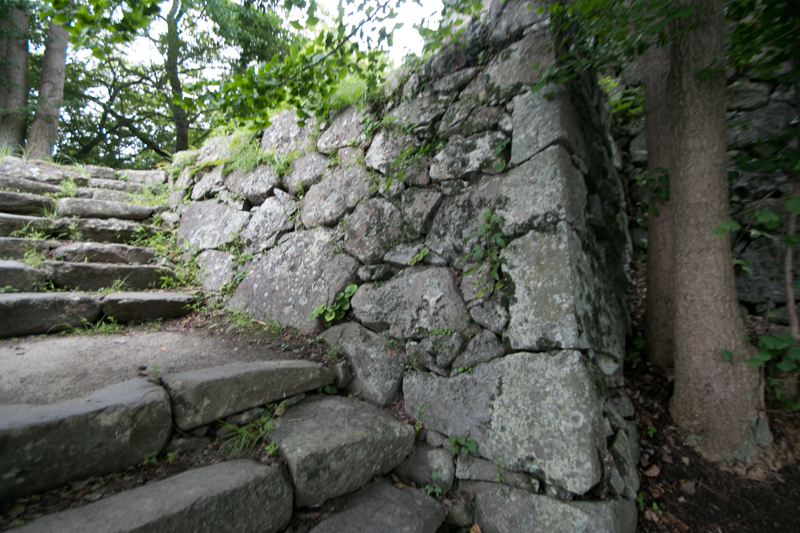 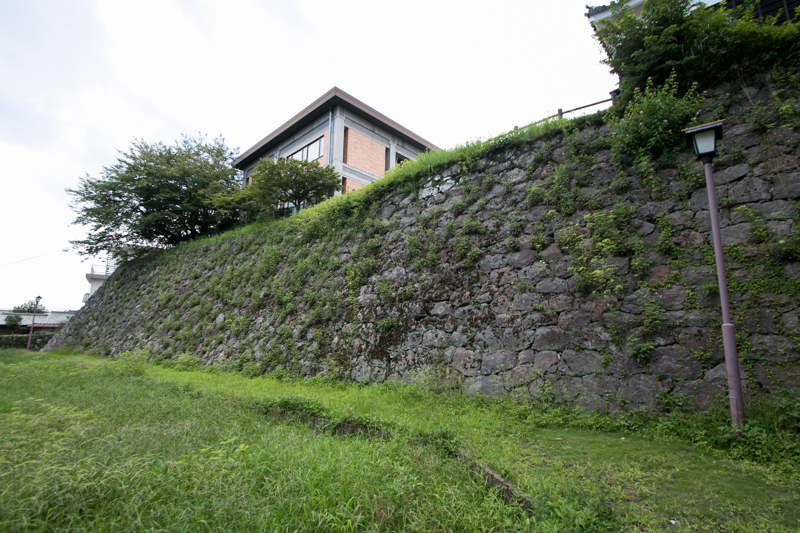 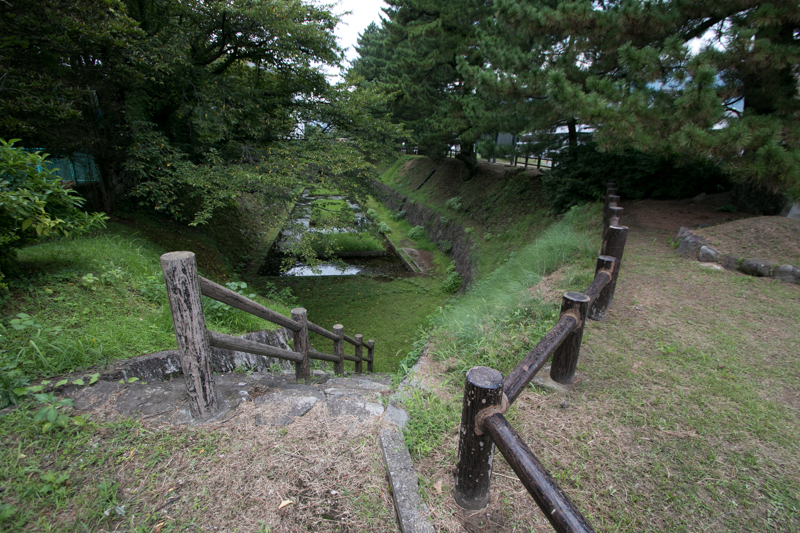 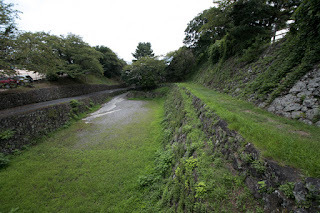 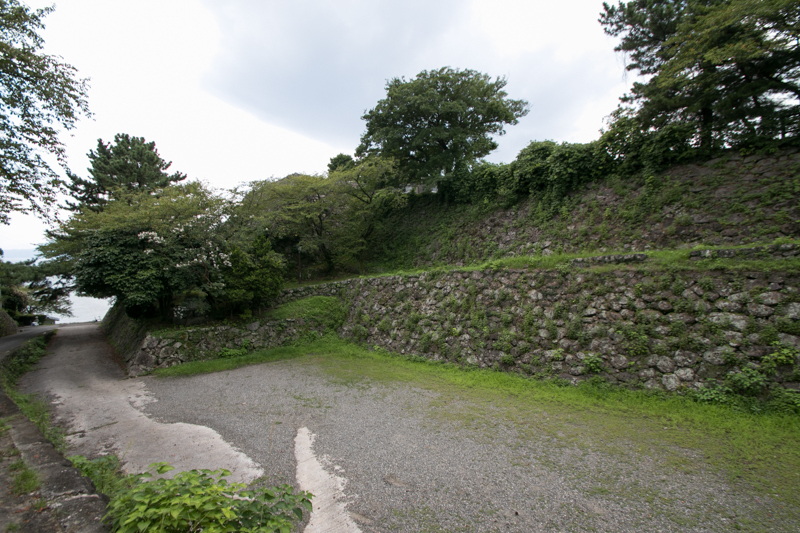 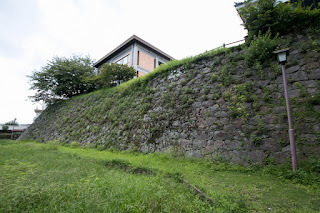 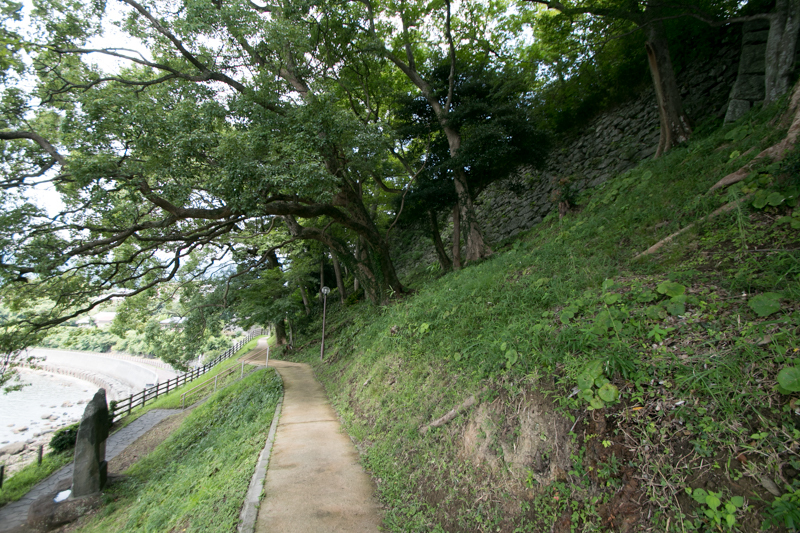 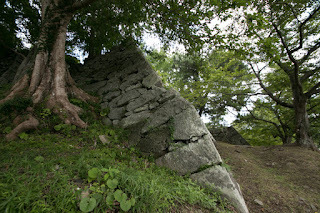 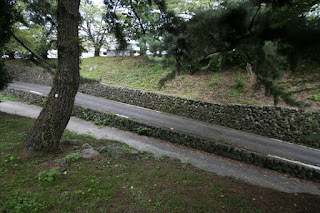 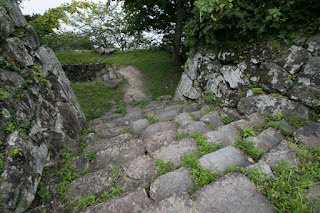 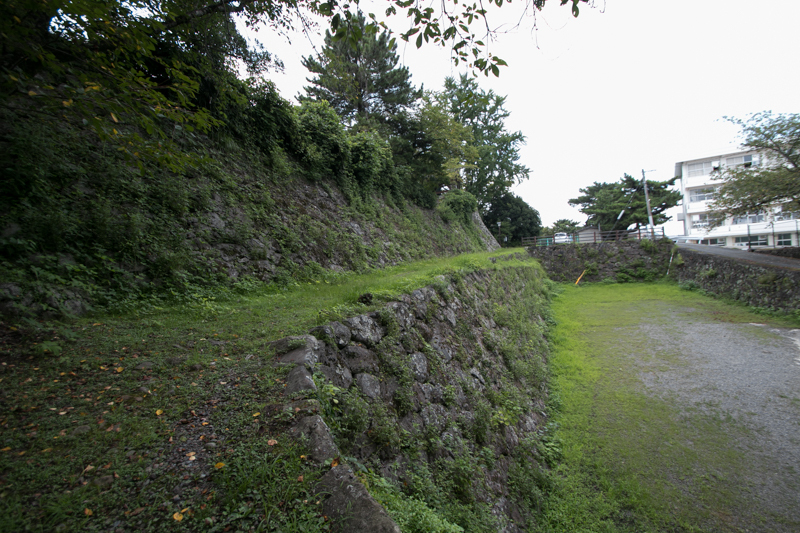 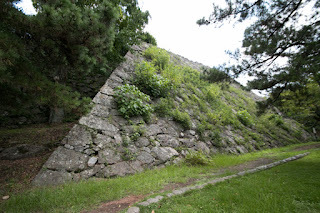 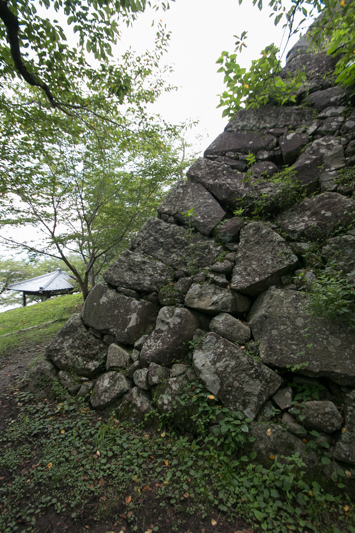 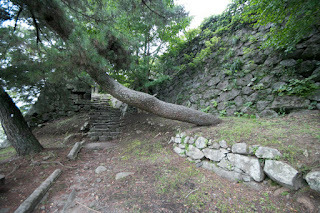 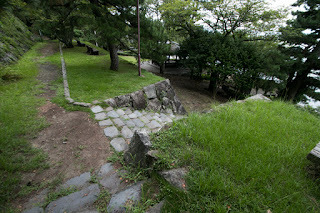 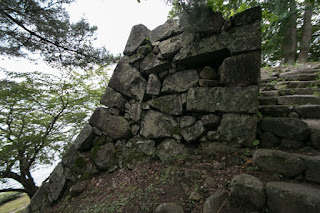 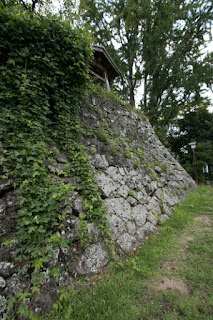 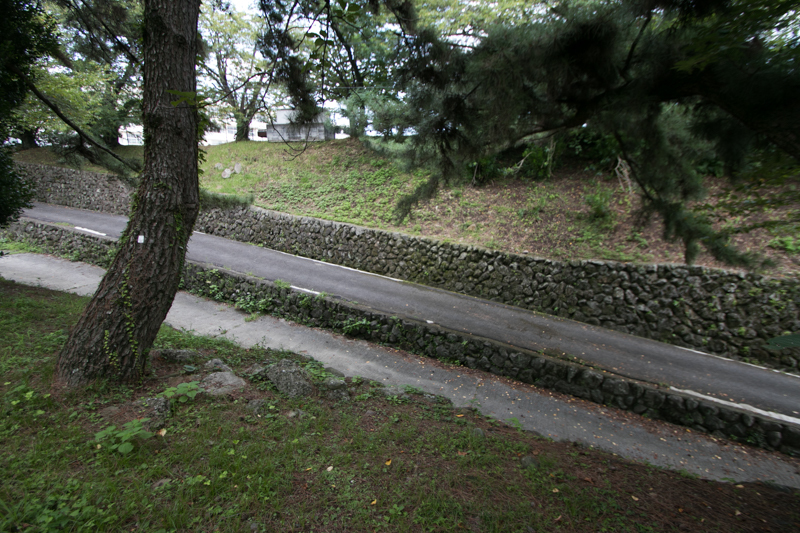 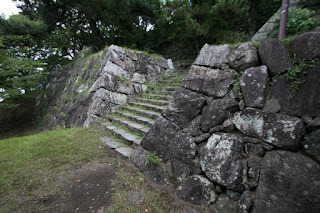 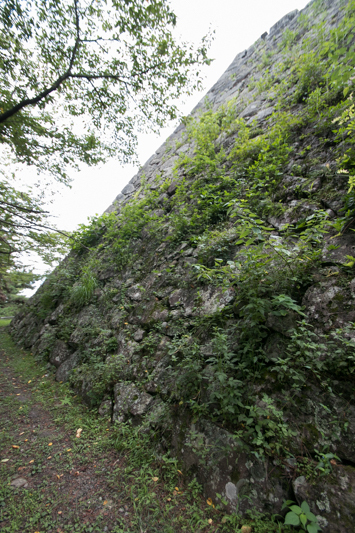 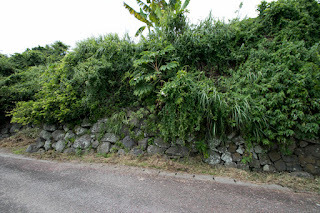 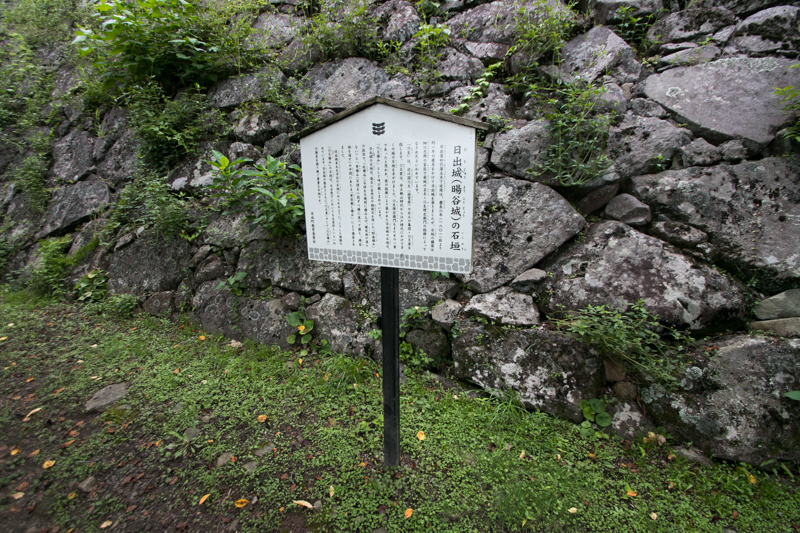 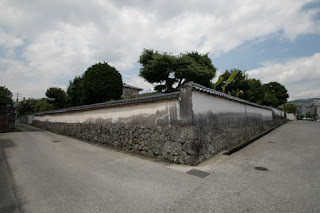 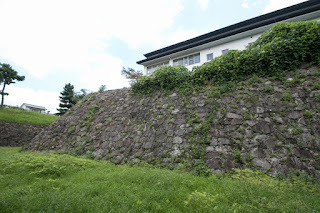 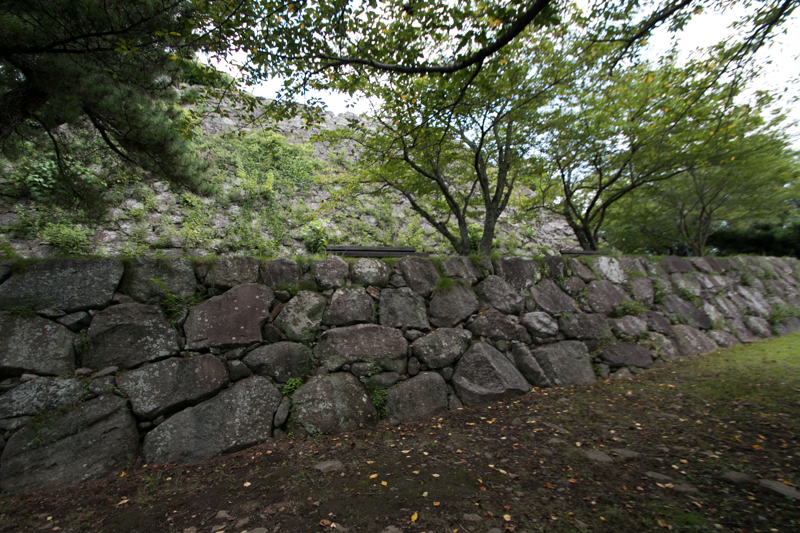 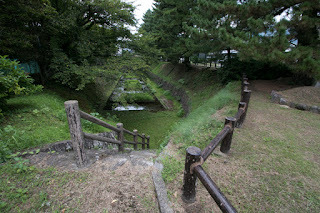 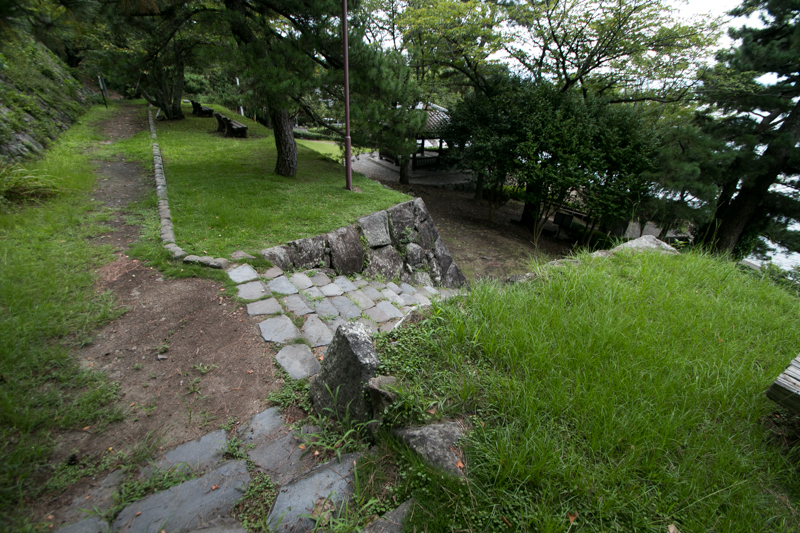 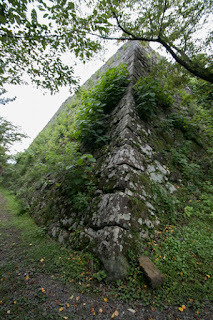 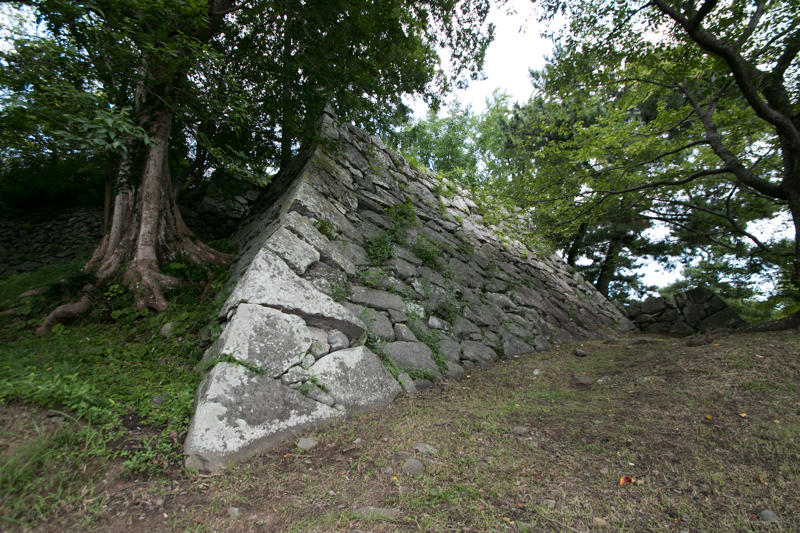 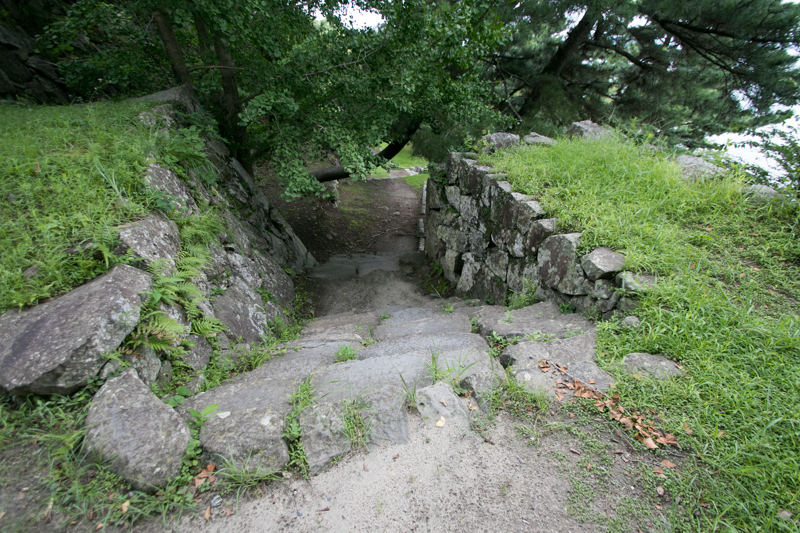 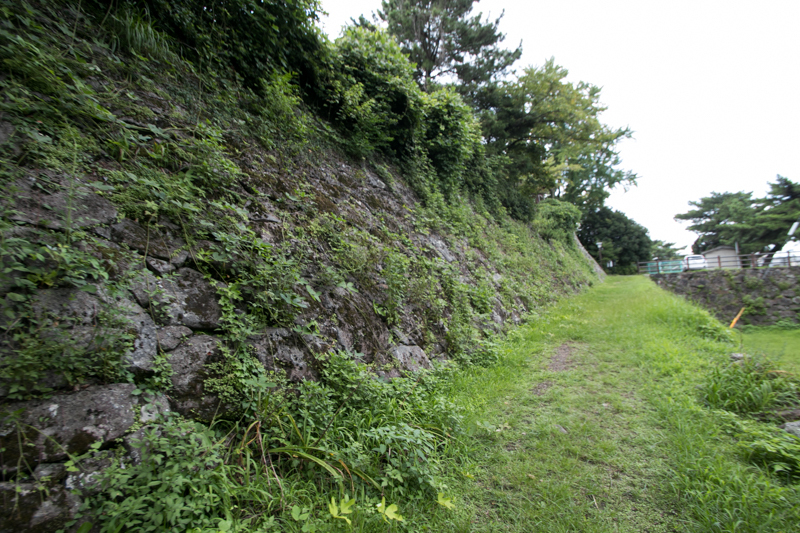 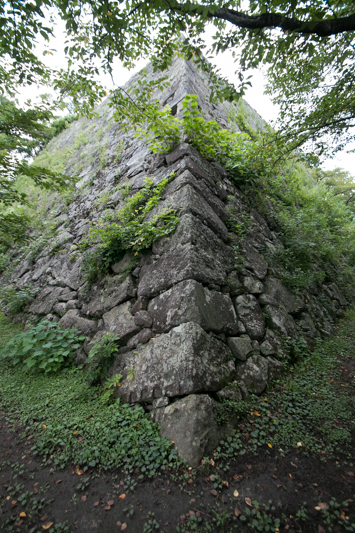 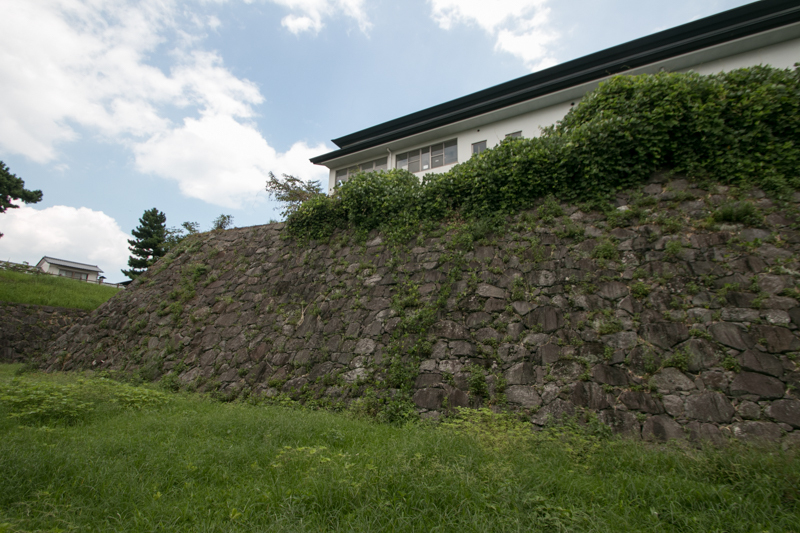 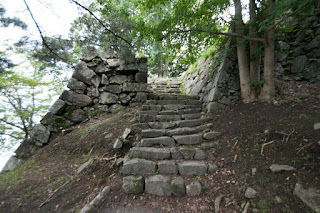 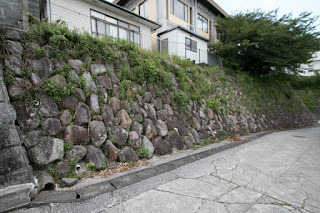 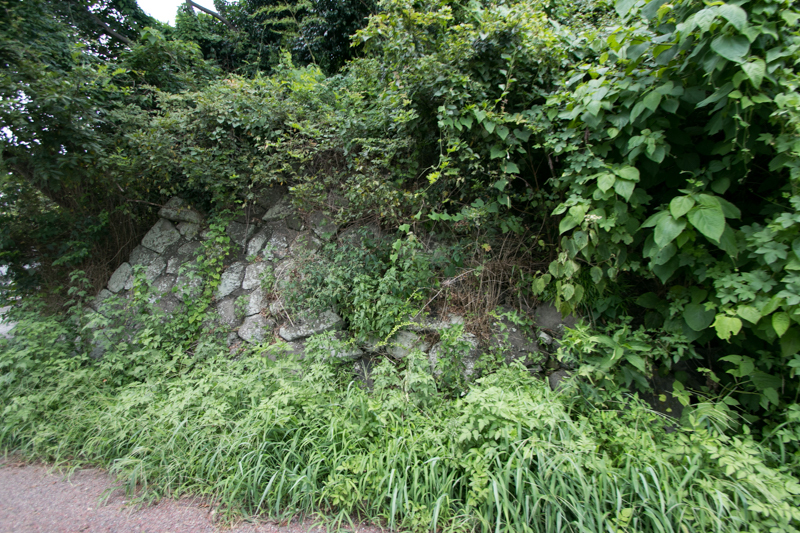 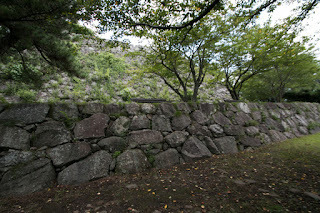 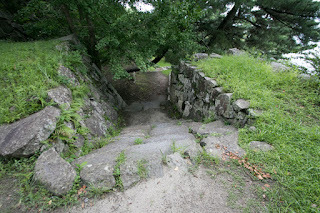 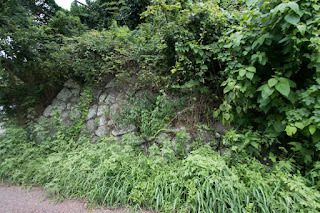 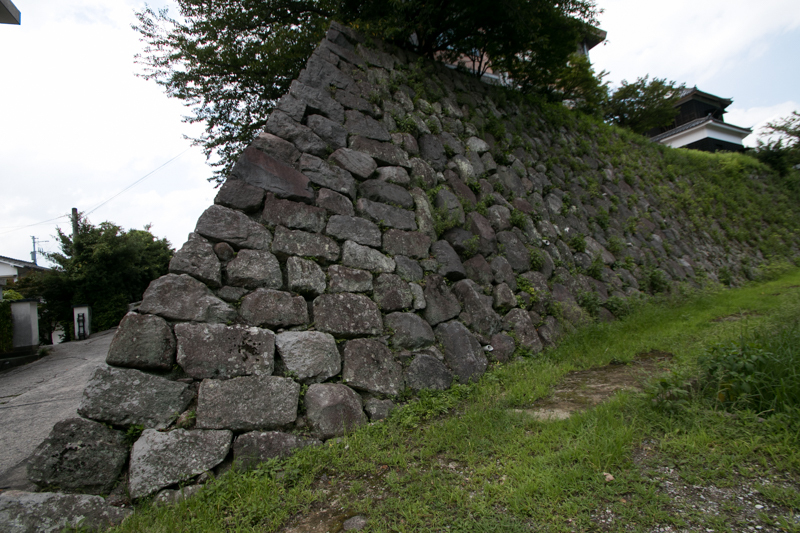 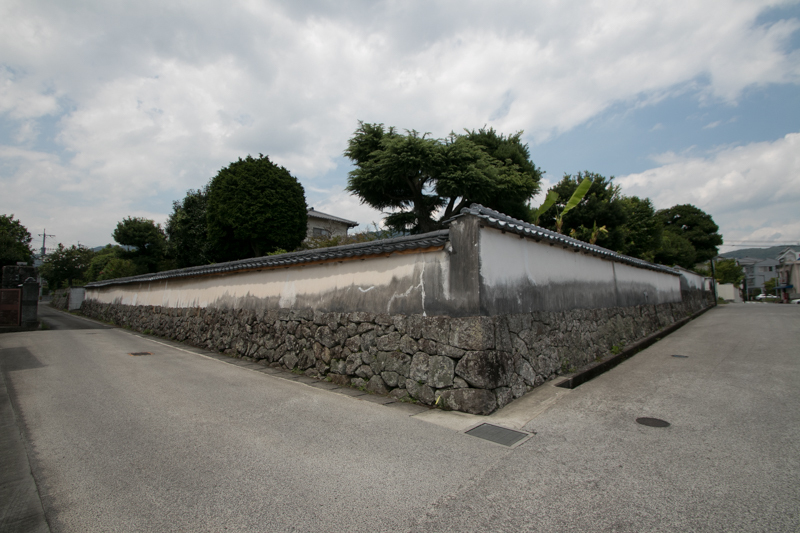 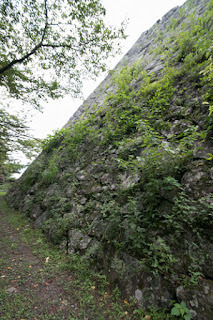 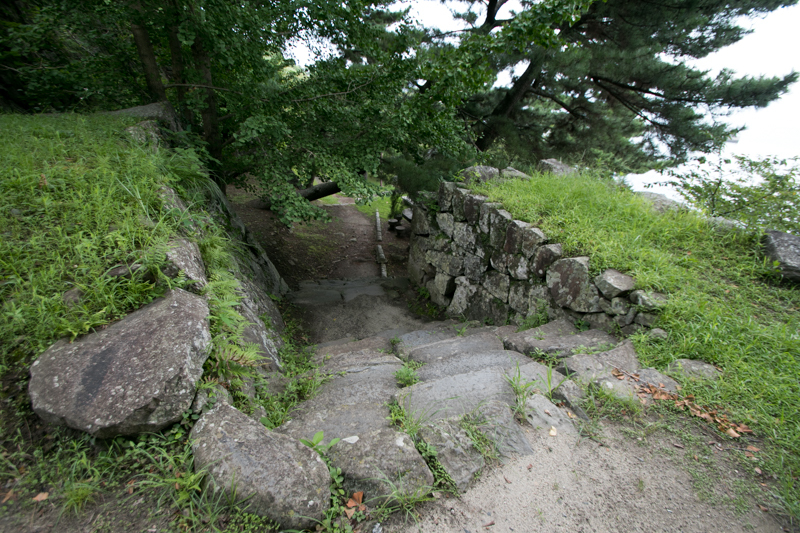 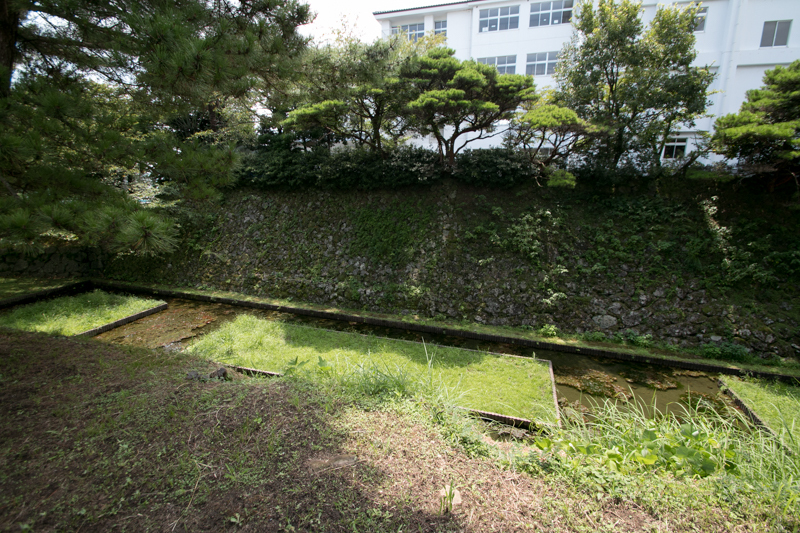 Looking at a magnificent stone wall inside of linear wide dry moat of Hiji castle built by Kinoshita clan, which promoted as a wife's parents' house of the ruler and built the castle under assistance from their wife's house, it reminds us importance of marrtal relationship between clans if effectively works. 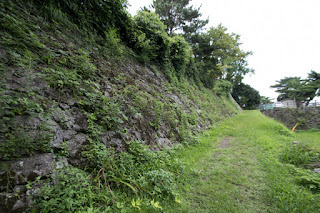 10 minutes walk from JR Kyushu Nippo Honsen line Yokoku station. 15 minutes drive from Hiji By-pass Hiji interchange.